Recently I’ve been thinking about how introduce Mr Tall (6) to comics, so I was very happy to be contacted by Vince Kamp, the author/illustrator behind the Robotslayer app and book. This is a bit of a departure from our usual picturebook-style stories, as it is a full length 60 page graphic novel for slightly older children. So I was intrigued to see how it would work on the iPad and whether we would enjoy the story. If after reading this review you like the sound of it, Robotslayer is free on the App Store until the end of February. The story is set in Robotolis, a city built by robots but now ruined as the robots have all been infected with a virus by the evil Dr Grububble. Everyone has left except Professor Robotolis, who built the robots, grandson Leo and his little robot brother Benny. 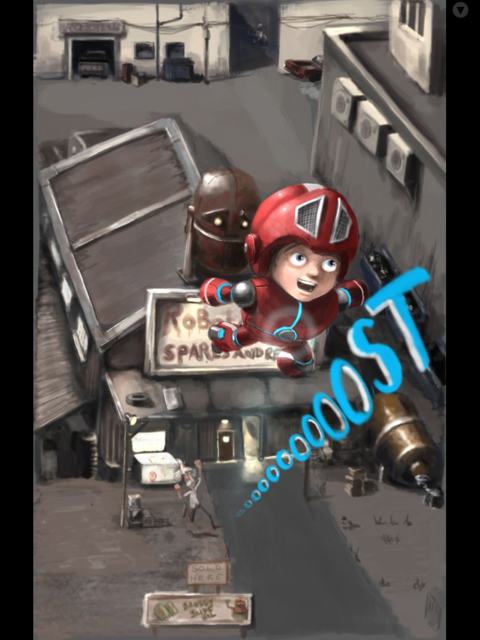 In order to beat Dr Grububble, Leo has to become a superhero – the Robotslayer – using a special suit and equipment such as turbo boosters and thunderfists built by Professor Robotolis. Can he save the day and destroy the main computer which holds the virus? I sat down with Mr Tall and read Robotslayer with him (the text is quite small, so it is a bit tricky for younger children.) Despite its length we read it through in one sitting. It’s a very appealing action-packed story perfectly targeted at primary school age children. The characters are well drawn and you really root for Leo and Benny. The dialogue is great and Mr Tall laughed out loud at some of the exchanges. There are also some nice references to films in there – we spotted Star Wars and possibly James Bond, and I am sure there are more we have missed! We loved Vince’s illustrations which really brought to life the Robotolis world. It is listed as ages 9+ on the App Store, but I think this is a conservative rating and it is fine for ages 6+. It is much milder than the name Robotslayer might suggest. After we tested the app and decided to blog about it, Vince also sent us a copy of the book version. I’m very glad he did as it’s great to compare the two. I think the book format is slightly easier to read (as the text is quite small in both versions) and it is also easier to navigate as it is clear how far through the story you are as you read. However the app version’s music adds a lot of atmosphere and it has hotspots with extra sound effects which generally work well. Recurring cameos from a pair of rats breaking wind went down very well with a particular 6-year-old boy I know! Finally, a Robotslayer training game is included so you can play just like Leo. It’s a simple shooting game – shoot the robots and avoid the rats – but surprisingly addictive. My high score is way below Mr Tall’s! Robotslayer is a real family affair. 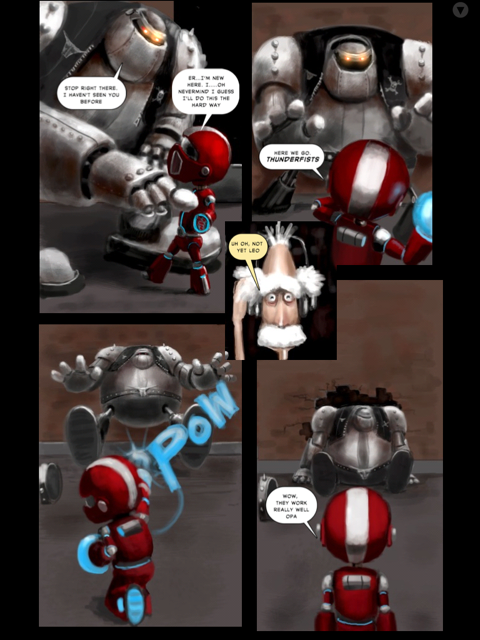 Do have a read of Vince’s story in which he explains how he created the story for his sons Leo and Benny, and included his Dad as Opa (Professor Robotolis). He was clearly very dedicated to bringing this story into being, and I really like the personal nature of the project in creating the characters based on his sons. 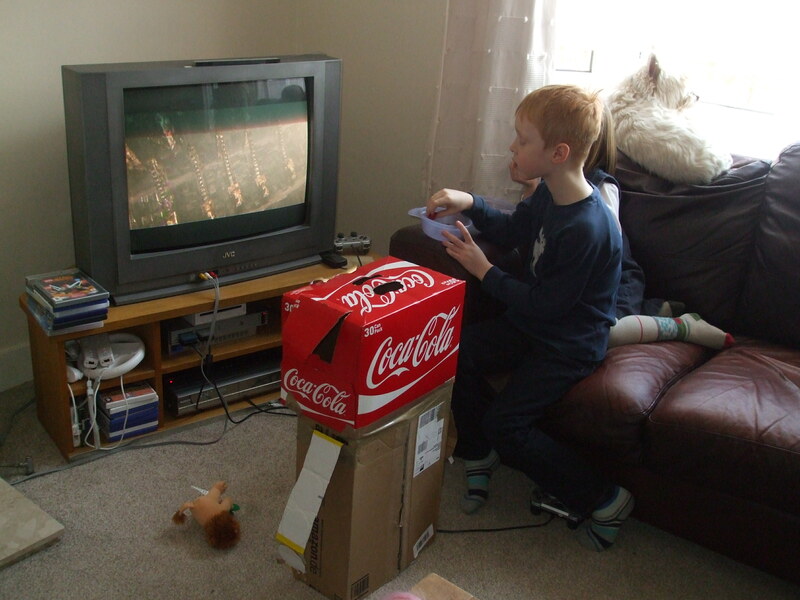 He’s also built an awesome 8 foot robot which is featured in that link. 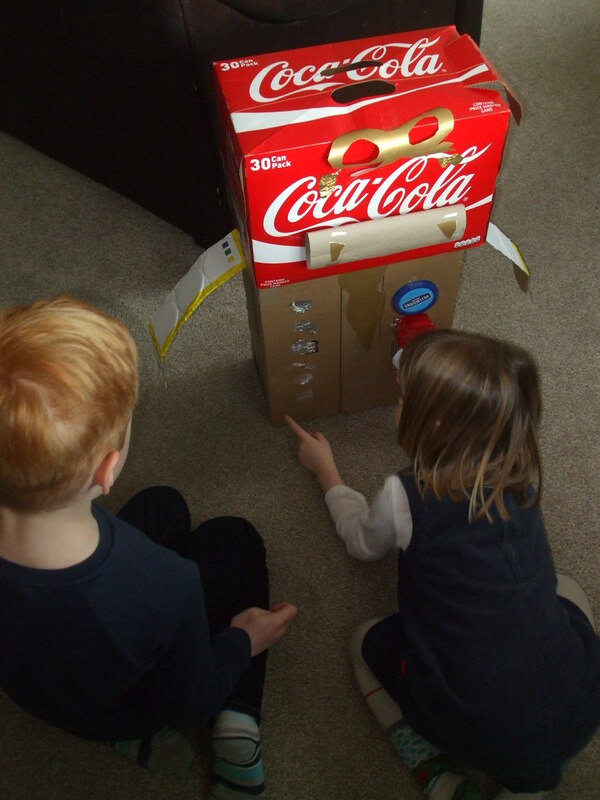 In fact we were so impressed by Vince’s robot-making skills that we wanted to have a go too! 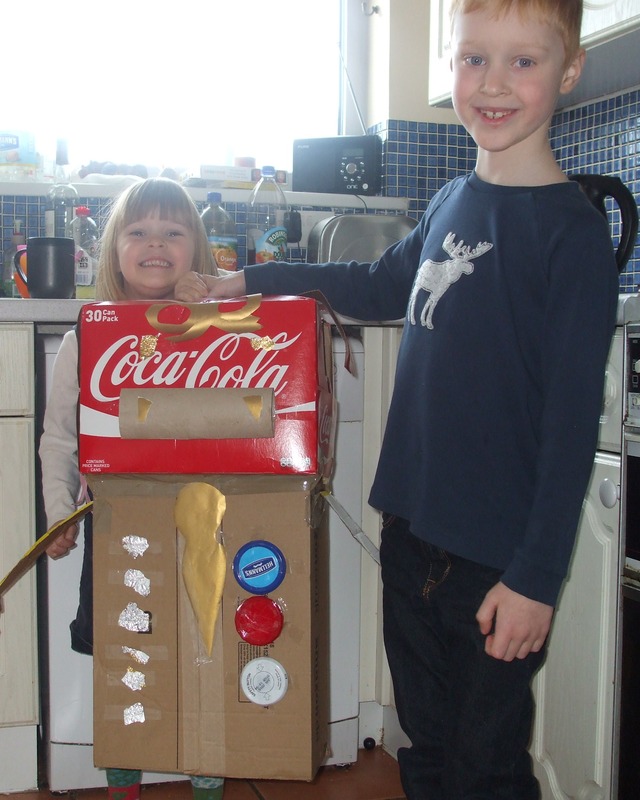 Here is our junk robot, known as Superbat or La-La depending which child you ask. We had a lot of fun deciding what our robot could do, and making spare parts which it keeps inside its head. There are also markers to show you if the robot is hot, cold or just right, depending which one you pull out of the hole in the side of its head. Keeping on the robot theme, we decided to watch WALL-E, one of our favourite films of all time – and so of course Superbat/La-La had to watch too! 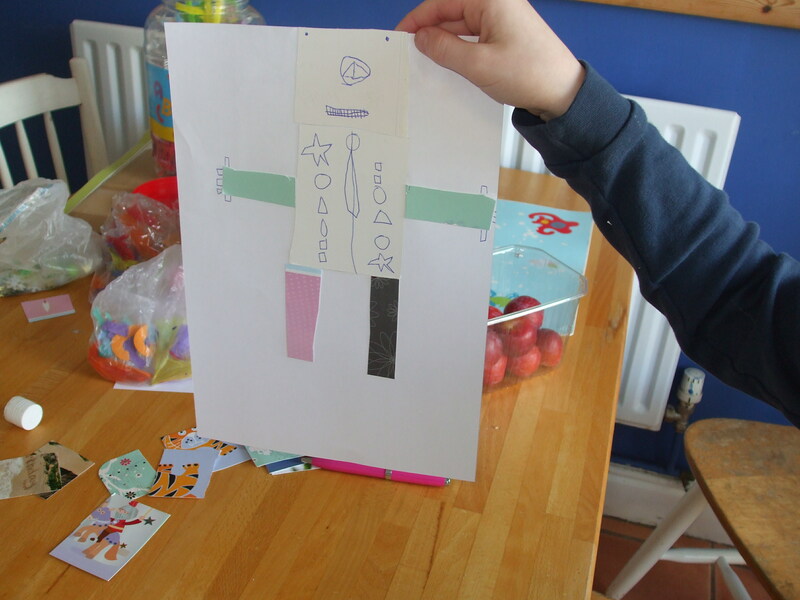 We also designed our own robots in 2D using cut out pieces of old birthday cards. Here’s Mr Tall’s design. I think Robotslayer will be an app and book that we come back to every few months and read thoroughly, rather than an everyday quick app, and it is none the worse for that. It needs those times when we can sit down in some peace and quiet to make the most of it. But certainly we’ve been impressed by this, our first foray into comics on the iPad and I hope we can find others which match it in quality of storytelling and artwork. 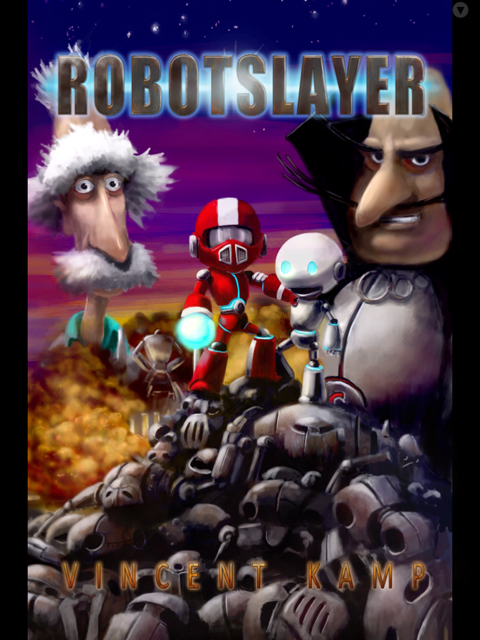 Robotslayer, developed by Vincent Kamp/Hover Studios, compatible with iPad. Available from https://itunes.apple.com/gb/app/robotslayer-volume-1/id720763564?mt=8 free of charge until approx. 28 February 2014. Disclaimer: I received a free copy of Robotslayer in app and book formats, but as always this review represents my honest opinion. Receive all new posts by e-mail.